Importante: el presente artículo fue escrito, en primera instancia, para ser leído por la comunidad chilena que actualmente reside en Melbourne, Australia. Fue pedido en idioma inglés porque muchos chilenos de esa comunidad, especialmente los más jóvenes, no dominan bien el español. De modo excepcional este artículo es incluido en inglés en Revista Escáner Cultural, a petición especial de la autora. Being Aesthetics my professional field is not my role to get deep into the political features of these issues but to comment on the sociological and stylistic aspects surrounding them. Specifically, what captures my attention in this opportunity is the remarkable difference between the Mexican style of public protesting and the Chilean one, due to the disposition of the participants involved in these urban episodes of citizenship expression. In both countries, Chile and Mexico, the main public urban manifestations take place on the civic centers of their capital cities, being Santiago the one in Chile and Mexico City the metropolitan city in Mexico. Nevertheless, in the case of Chile we could include the civic center of Valparaiso city as an optional protest setting due to the fact that the Parliament House in settled in this charming harbor capital. Social, and therefore aesthetic dynamics of 2012 public protests have proved to be almost opposite in each one of the cities that I mentioned, involving similar starts but dramatically different closing stages. At the beginning, is all about banners and crowds gathered in a predetermined urban focal point of departure. In the Chilean case, the multitude is mostly composed by young people (from 15 to 40 years old) apparently involving a little percentage of men over the proportion of women. Children and late adults are generally out of these sorts of public events, although they manage to participate from safe location points such as balconies and the upper part of monuments. 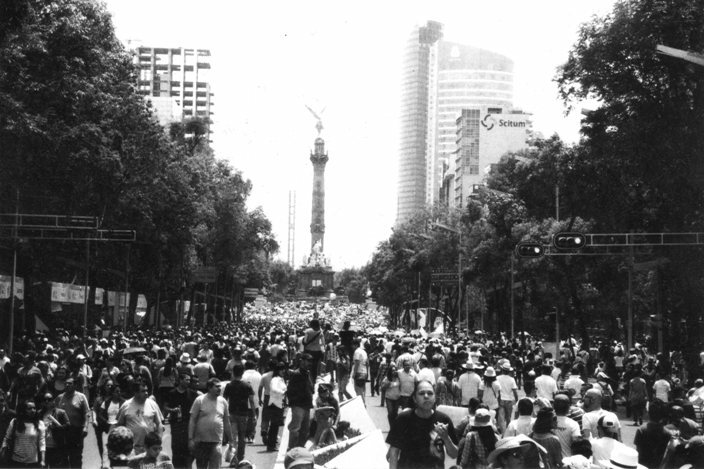 In Mexico, however, citizens of any age are to be be found in the main ground of a political public demonstration. The predominating age group will be the one most affected by the protested issue; nonetheless this group normally represent a minor difference in percentage with the other age groups to be found. Why this age exclusion is more significant in the Chilean case? Maybe this difference does not seem to be crucial. Nonetheless, it really is, considering that most political discontents are not private of one age group but directly affect various segments of the population. For example, and consequently with this idea: in Chile, parents and even grandparents of students become as distressed as the students themselves by the raise of school and university fees since it is them who frequently must bear the total or partial payment of these considerable amounts of money. Therefore, it is obvious that disinterest in the solution of the expressed demands is not a reason for the homogeneity of the “protesting age group”. 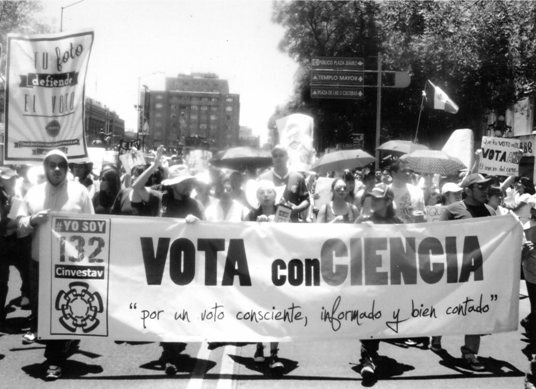 Distinctively, in Mexico almost “everyone” is to be found in a political protest. The public civic main areas become common field of expression for the “whole family”. As naive as this may sound, it is the observed phenomenon. Of course there is still a majority of young people present in these public affairs due to the physical shape that manifestants must enjoy in order to walk long distances under the sun or under the rain (Mexico is pretty wet during summers). Nevertheless, this young majority is never as significant as in the Chilean case although more proportionate with the other age groups that can be differentiated in the protest. One noteworthy explanation for this comparative issue is that Chilean civic center frequently becomes a “civic battlefield” in the final stages of a political protest. What starts with banners, parades and protest intonations ends up in unwanted disturbs and violent confrontations between the police force - supposedly there only to supervise the multitude - and some ill-disciplined members of the protesting crowd. These members commonly are part of a small but (unfortunately) powerful group of disobedient people that spoil the civilized demonstration that the entire group endeavors to carry out in an organized and pacific way. Subsequently, who is not able to run for his/her physical integrity in the last moments of the protest, normally stays out of public manifestations. I am not saying here that a completely peaceful manifestation it is impossible to be found in my mother country; I am merely referring about the destructive end of the main amount of them, of course. Interestingly, in Mexico violent situations during public gatherings do not seem to happen on a regular basis, although they do possibly take place exceptionally. Undoubtedly, political discontent in Mexico is bigger than in Chile and consequently, social tension during the electoral period was actually high (almost intimidating). For this reason, there was at least one monthly protest accomplished in the civic center during half a year; none of them distinguished by aggressive disturbs involving human and material lost. Thus, in a country with severe political and social problems, public expression of dissatisfaction seems to be successfully achieved. If the harshness of the problems to be conveyed is not what determines the composure of public demonstrations, then why most Chilean collective manifestations turn out to be hazardous? Why cannot public protests develop seriously and (mostly) peacefully, as the Mexican ones do? In my opinion, we should not blame this on Chilean social defects. Conversely, Mexican society is more mature than the Chilean one in this respect, which explains the advantages that the Mexican society presents during its communal public congregations. Centuries of pre-Hispanic civilization followed by a vice royal and a republican history and these three historical periods being filled with massive and dreadful social tribulations explain why Mexicans are noticeably more capable of performing serenely when acting together in public domains. Certainly, there are other sociological causes determining this issue, being “historical social maturity” only one of them to take on account when analyzing this issue. However, is undoubtfully a very influential one to consider in this respect. Conclusively, Chile has a lot to learn about pacific ways of occupying its public spaces. I am optimistic that this learning process will take place throughout the following years on behalf of two assumptions: first one; globalization produces cultural linked societies to homogenize their (positive) behaviors quicker than half a century ago. Second one: if Mexico could learn from its social mistakes and bad experiences, Chile surely can. Images produced and authorized by: Martin Covera, Chile, Leonardo Olmedo, Mexico and Osiris González, México.